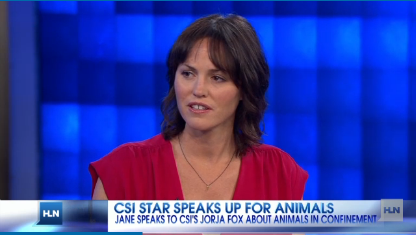 Let us not forget that Jorja is way more than just an actor, she’s an advocate who speaks up for the animals. Jorja was, again, on Jane Velez-Mitchell, talking about the movie “Blackfish” which peels back the curtain to look at the real life of animals at Sea World. This is probably why she didn’t live tweet last night, by the way. The movie Blackfish airs on CNN tonight at 9pm ET. I’ve set my DVR to record it, because I am typing this on an airplane. I don’t think Jorja’s on tonight, but … well I can’t tell anymore. By the way, CBS is not the worst about blocking you from downloading video. I had to screenshot this the old way. Jorja? Amazing as hell and I love that she’s backing this issue. What the HELL about that interviewer though? Sweet God. @Shauna Brock: Jane is a very outspoken activist, and given the fact that she does go all out in pursuit of justice, she’s become VERY direct and attacking. I understand why 🙂 I’m glad she’s doing this too. @Mika E. (Ipstenu): I didn’t know that about Jane, so good on her. But I was specifically referring to her interview presentation overall. I felt like I was listening to yet another Nancy Grace. And it’s probably more on CNN/HLN than on Jane because they are definitely cultivating a style. I saw it in theaters a few months ago. It was really good at showing the truth behind sea world.